June is National Dairy Month and I'm doing my part to promote America's dairy industry by eschewing all of the lactose sensitive/intolerant friends of mine and making banana pudding. Around here, it's called nana puddin', nanner puddin' or just plain puddin', but never ba-na-na pud-ding. Too many syllables. I really don't like pudding. It's texture doesn't thrill nor sway me. I don't wake up in the middle of the night craving it. I don't put it on my wish list at Christmas. I pass over it in buffet lines and at dinner parties. But I do, on occasion, make it for my friends and family who request it. Recently, I was asked to make some and I agreed, setting out eggs, milk, and flour to proceed to swirl it into a fluffy, creamy dream. "Well, where's the pudding? What are you doing with all of this stuff?" "Well, the pudding's in the making. I've got to do a little culinary chemistry and make it. From scratch." "Scratch? What is scratch? Is that something you can get at the store?" That's when I knew I needed to post about pudding. Ok, there are two types of pudding: sweet & savory. We're going to focus on the sweet. Pud-ding (n): a sweet milk-based confection similar in consistency to egg custards as well as bread and rice-based puddings. 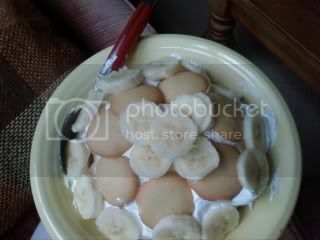 Two things banana pudding must have: bananas (believe me, people have tried to make it without them) and Nilla wafers. Not vanilla wafers, Nilla (nil-uh). Nabisco is my friend and so are Nillas. The toppings are optional: whipped cream, Cool Whip or meringue. I prefer whipped cream, but that's another post for another day. You can skip this post, so right to your local grocer and pick up a few boxes of Jell-O brand pudding and call it a day, but there's nothing like pretending like you didn't scorch your eggs over a low flame while adding cream, milk, and sugar to the pot. 1. Mix sugar, flour and salt in top of double boiler. Blend in 3 egg yolks and milk. Cook, uncovered, over boiling water, stirring constantly for 10 to 12 minutes or until thickened. Remove from heat; stir in vanilla. (Or you can follow the above steps in a 2-quart saucepan & skip the double boiler. Use a heat-safe rubber spatula to stir your pudding, making sure you scrape the bottom and sides of the pan to prevent sticking and cooked eggs. If you see cooked eggs, it's ok, just use a mesh strainer or colander to strain your custard. Even fancy chefs overcook custard sometimes). 2. Reserve a handful of wafers for garnish. Spread small amount of custard on bottom of 1 1/2-quart casserole; cover with a layer of wafers and a layer of sliced bananas. Pour about 1/3 of custard over bananas. Continue to layer wafers, bananas and custard to make a total of 3 layers of each. Cool slightly or refrigerate. Garnish with additional wafers and banana slices just before serving. Mmmm, sweet banana pudding. It's pretty much always called by the full name for us. :) You gotta have the Nilla wafers, no matter what. That makes the pudding! Yum, that looks so cool and tasty I sure would like a bowl (a big one) of that puddin' right now. Ah, the famous Nilla wafers. I don't even have to talk about them, they are just delicious and perfect for your nanners. This looks perfect as is (of course) but I was just thinking, how about sour cream or buttermilk for the puds? Whatcha think? Man, that really is a piece of childhood - church potluck. Y'all can have all of the pudding in the world. I will gladly make it for you, Just don't ask me to join. Adam: You mean subbing buttermilk for the regular milk? that would be a bit tangy, I think. I'm not sure if that would be pleasant or not. I wonder when I last made pudding? It may be time to give it a try again! Sometimes pudding just hits the spot! I don't think it's too hard to make from scratch. I haven't bought instant in years. Banana pudding is a beautiful thing. You don't see a lot of it here up north. It's always a special treat when I see it. I think this is something I would like!